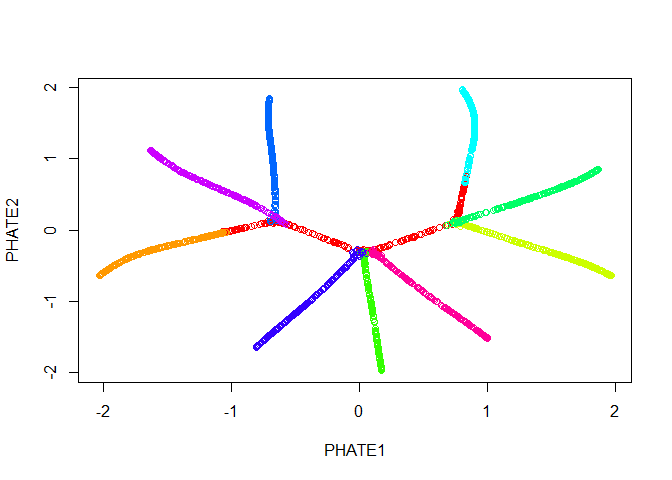 PHATE is a tool for visualizing high dimensional single-cell data with natural progressions or trajectories. PHATE uses a novel conceptual framework for learning and visualizing the manifold inherent to biological systems in which smooth transitions mark the progressions of cells from one state to another. To see how PHATE can be applied to single-cell RNA-seq datasets from hematopoietic stem cells, human embryonic stem cells, and bone marrow samples, check out our preprint on bioRxiv at < http://biorxiv.org/content/early/2017/03/24/120378>. 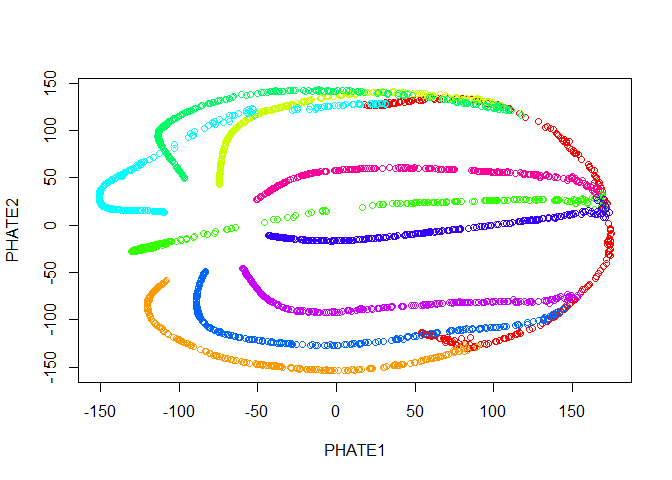 This R package provides an implementation of the PHATE dimensionality reduction and visualization method. For our Python and Matlab implementations, please see KrishnaswamyLab/PHATE. In order to use PHATE in R, you must also install the Python package. This is a basic example running phate on a highly branched example dataset that is included with the package. You can read a tutorial on running PHATE on single-cell RNA-seq at http://htmlpreview.github.io/?https://github.com/KrishnaswamyLab/phateR/blob/master/inst/examples/bonemarrow_tutorial.html or in inst/examples. 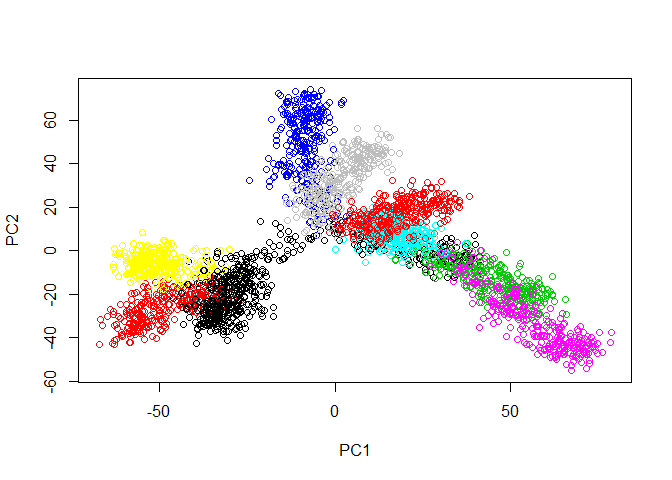 First, let’s load the tree data and examine it with PCA. Now we run PHATE on the data. We’ll just go ahead and try with the default parameters. Good news! Our branches separate nicely. However, most of the interesting activity seems to be concentrated into one region of the plot - in this case we should try the square root potential instead by using gamma=0. We can also try increasing t to make the structure a little clearer - in this case, because synthetic data in unusually structured, we can use a very large value, like 120, but in biological data the automatic t selection is generally very close to ideal. Note here that if we pass our previous result in with the argument init, we won’t have to recompute the diffusion operator. 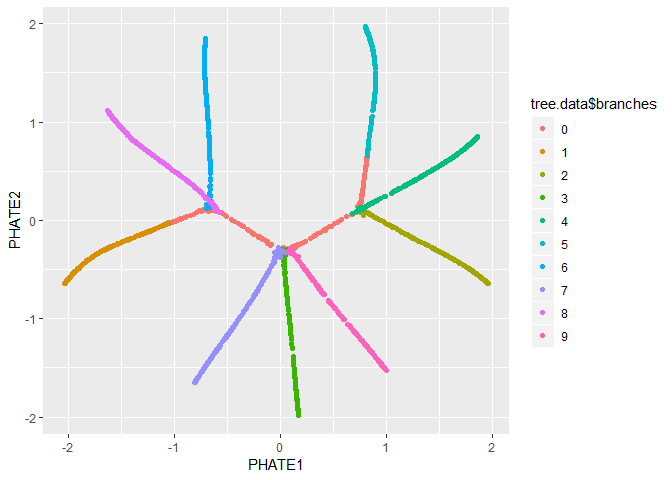 We can also pass the PHATE object directly to ggplot, if it is installed. Please let us know of any issues at the GitHub repo. If you have any questions or require assistance using PHATE, please read the documentation by running help(phateR::phate) or contact us at https://krishnaswamylab.org/get-help.